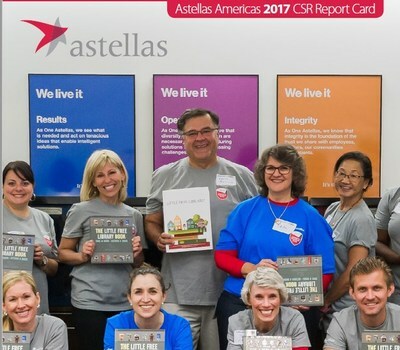 NORTHBROOK, Ill., Oct. 9, 2018 /PRNewswire/ -- Astellas today issued its third-annual Americas Corporate Social Responsibility (CSR) Report Card. The Report Card, which can be found here, outlines the company's progress made during Fiscal Year 2017 to fulfill its commitments to patients, employees and the communities where we work and live. Providing Disaster Relief: In response to an unprecedented season of natural disasters in 2017, Astellas USA Foundation and Astellas worked together to train and send 10 employee volunteers to aid hurricane victims in Houston, Texas, and Orlando, Florida, as part of the Red Cross Disaster Responder Program, one of only four companies to do so.